The Game Joy is a Sega Mega Drive clone console sold in Asia. Like many clone consoles, the shell is stolen from a Genesis 3, but in this case, has been recoloured silver and blue. 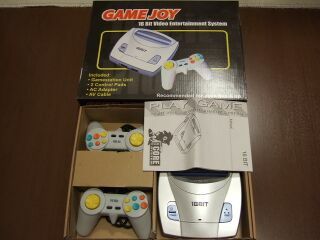 The console isn't entirely sure what it wants to be called, having the names "Game Joy", "Gamestation", "Play Game", "Mega Drive 3" and "Mega Drive 2*" dotted around the box contents. It is possible that the system was distributed under many names as a result. The system is capable of playing games from all regions, though it is assumed it might struggle with the add-ons. Power supply, which calls the console a "Mega Drive 2*"